Compact, programmable machine brews coffee and espresso from bean to cup. Saeco’s new dual pressure lever allows you to brew both espresso and regular coffee from whole beans. Then use the Classic Milk Frother to prepare delicious milk specialties the traditional way, guaranteeing a gorgeous foam. The Minuto also features a quick heat boiler for simultaneous brewing, and a ceramic grinder ensuring a perfect grind and long-lasting performance. You can also set the beverages to your taste, with customizable settings for adjustable length and strength, an adjustable grinder to play with coffee richness, and an adjustable dispensing spout for a perfect fit for all cups. The Minuto features a one click removable brew group, dishwasher-safe drip tray, fully automatic rinsing and descaling, and a quick heat boiler for simultaneous brewing. 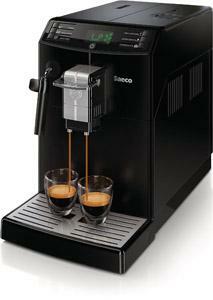 With just a flip of the Dual Pressure Lever, you can enjoy coffee and espresso made from whole beans. Espresso brews at 15 bars of pressure and coffee brews at 2 bars of pressure. Saeco’s heating boiler technology is superfast, allowing immediate brewing of each cup of coffee beverage one after the other. Thanks to the automatic rinsing and descaling cycles, you are guaranteed a perfect coffee every day and maximum longevity for your machine. Unleash your inner barista, preparing delicious milk specialties the traditional way guaranteeing a gorgeous foam. You will always get a perfect cup, brewed to match your personal preference, thanks to the machine’s adjustable length and strength. Pressing a button is all you’ll need to do to enjoy a superb beverage in your favorite cup. The Minuto’s ceramic grinders never overheat, ensuring you a perfect grinding, long-lasting performance and totally silent operation. It has five adjustable grinding preferences, from the finest for a full-bodied espresso to the coarsest for a lighter coffee. The brewing group–a Saeco invention–is the heart of their machines, ensuring that the machine makes everything on its own. You can effortlessly remove the brew group for regular cleaning with just one click. I received this product as a Christmas gift. The first time we set it up, the control panel gave us an error message that there was no water in the tank (there was). Trouble shooting did nothing so we got a replacement and after unpacking and setting up, got a different error message showing a wrench with an error code 11. The instructions are to call the manufacturer for assistance. They can provide a callback in 2 business days. We waited a few hours and tried again and the machine worked. The instructions are pretty clear and I am enjoying a cup of nice, hot coffee. I’m a little leery because of the manufacturer’s lack of accessibility. We had originally contacted Saeco on the first machine (had to call a few times) and they suggested we mail it to them for repairs. Um, no. Very grateful for Amazon’s wonderful customer service and returns policy and that they got us a new one asap, during a time of extreme weather and delays all over the country. Once I’ve completed my first weekly and monthly cleaning cycles without problems, I’ll feel more comfortable with a glowing review for the product. It IS a lot of money, so I expect it to perform in an outstanding manner. This machine makes good coffee, but the coffee isn’t hot enough. The quick start guide suggested increasing the temperature, however, the manual did not explain how to do this. I called customer service (Philips) who checked for over 30 minutes without finding out how to adjust the temperature. Finally, it was suggested I return the machine which I did. Maybe it was a one off problem.